This morning I drove out to Hudson, WI to shoot the Resident Evil Big Game at Splat Tag. This game has a sort of unconventional aspect, in that when a human player is shot, instead of waiting to reinsert, they immediately change over to the zombie team. This makes for some chaotic moments as players betray ex-teammates and paint flies everywhere. Proving that I still have what it takes, I managed to avoid all but about four shots all day. On a paintball-related side note, the NCPA Midwest North conference held their season opener this weekend, which I was not able to make. Keep your eyes open for photos from the later events though, I'll be shooting! To check out the full gallery and buy your photos, click here. For information on Splat Tag and their big games, check out the Splat Tag website. A Wild Bunch player (Delta Echo maybe? ), playing the role of one of the elite S.T.A.R.S. troops. 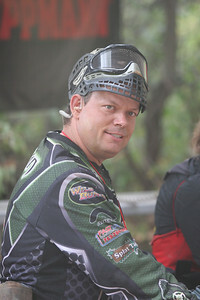 Darrin Johnson, owner of Splat Tag took to the field himself as one of the S.T.A.R.S. Once again, Darrin had the Splat Tag Angels on hand with Splat Tag tattoos for unsuspecting players. 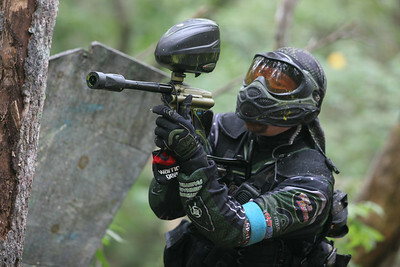 Keep on paintball, nice pics.